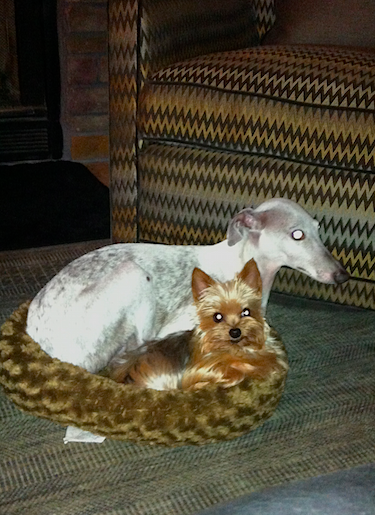 Here is my sweetie, Greyson, with his “sister” Chelsea. The whippet looks like an exquisite miniature greyhound. They are so graceful and elegant that when I walk with my dog, I often get stopped by strangers who ask me questions about my stunning hound and they want to pet him. This elegant and swift gazehound of short coat, has been around for thousands of years. First helping their owners in the hunt, sharing their home and warming their beds and hearts. This is evident by the innumerable uses of hounds on vases, paintings and statues, sometimes as old as the beginning of human civilization! 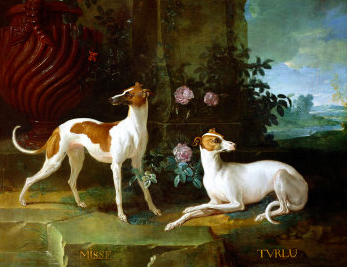 From the beginning of the eighteenth century, the whippet hound begins to appear in many famous paintings. One you might recognize is the one by Jean Baptiste Oudry depicting two dogs belonging to the king Louis XV: Misse and Turlu. Jean Baptiste Oudry depicting two dogs belonging to the king Louis XV: Misse and Turlu. 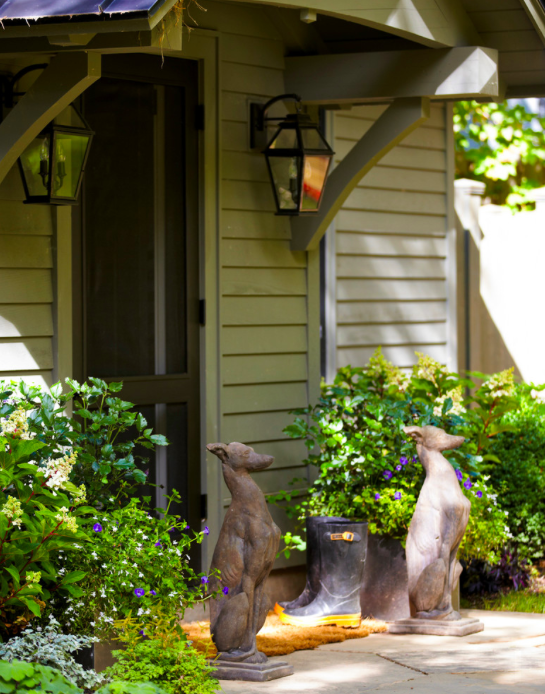 Thom Filicia uses these whippet statues to flank the entry of a home. The use of the whippets here, a sense of guarding the home, still comes off elegant and welcoming. 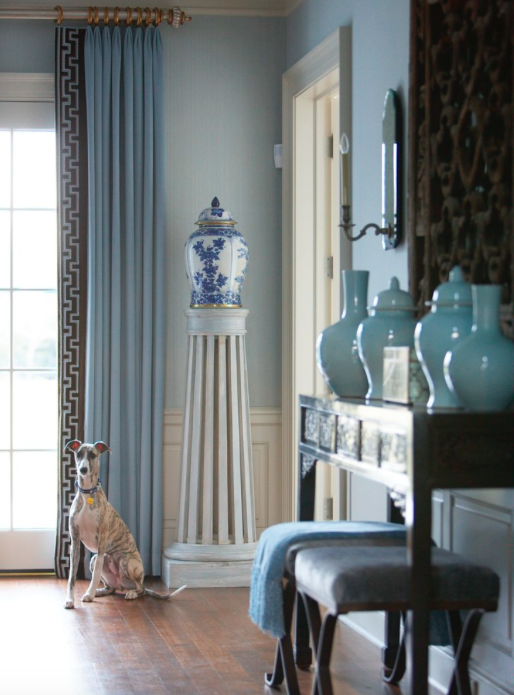 Ellsworth Ford Associates uses the whippet in a beautiful Foyer. 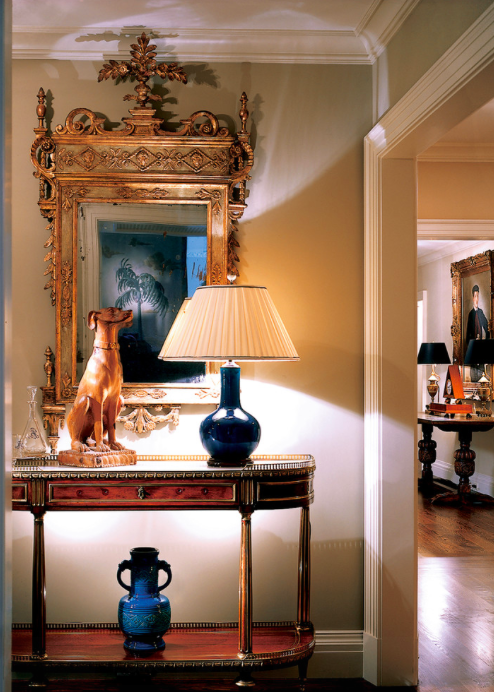 The use of the whippet in this Foyer is setting a rich and opulent tone of what is to come in this lovely home. 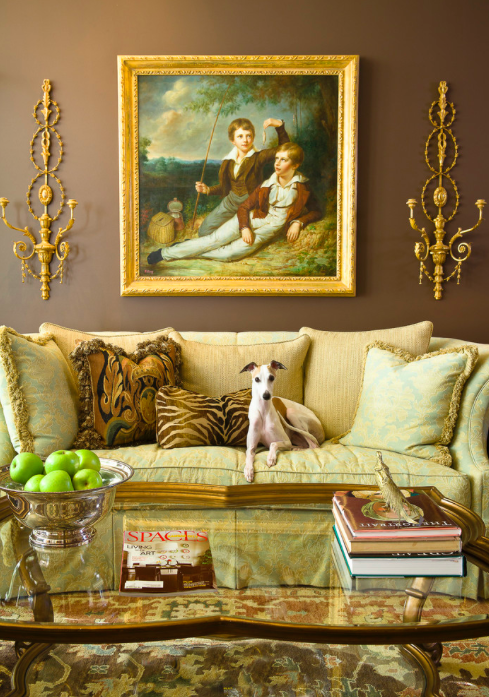 McCroskey Interiors gets a bonus when this precious whippet hops upon the sofa. Yes, the room is stunning! The whippet just takes it to the next level. What a nice surprise for both the Designer and the Owner to capture this shot. 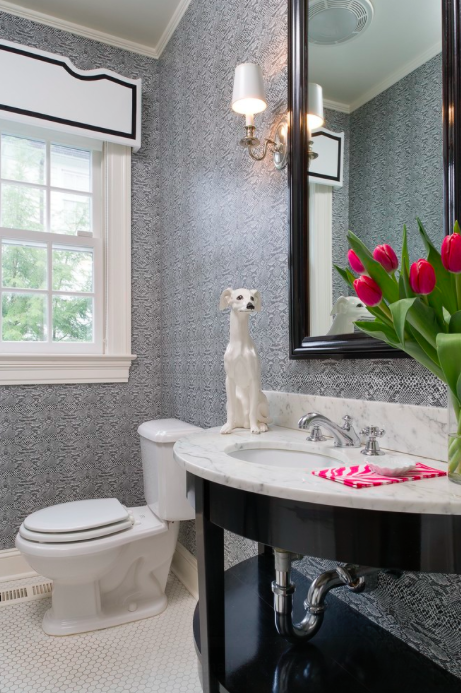 Tiffany Eastman Interiors use of the whippet in this transitional space is perfect. Whippets are often seen in interior design flanking the fireplace. 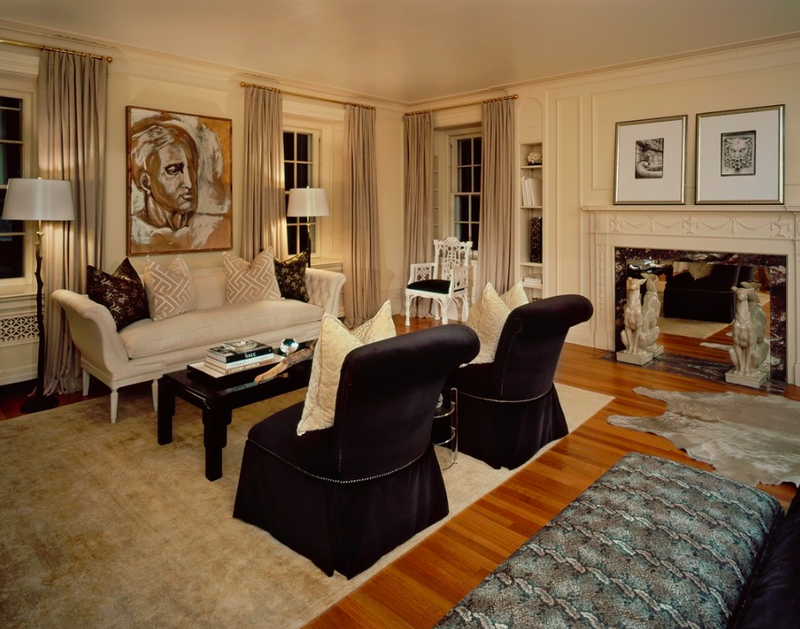 Here Tiffany Eastman uses this technique with an understatedly elegant transitional room. Tiffany Eastman does it again. What an adorable way to add a little something extra to this bathroom. Standing post at the sink, lol. Beautiful use of the whippet statue as an accessory. Cindy Rinfret gets a bonus here too! The room is lovely on its own. Doesn’t the picture look just a little bit better with the addition of the perched whippet? This lamp is sure to light up your room. This lamp is sold in both right facing and left facing. Perfect for atop a kitchen counter, desk, entry, etc. Old world sophistication is found in this statue. Perched by the fire, along a buffet or console, this beauty will certainly make a fine addition to your majestic home. Made in Italy, the Fritz shaped handle is molded in cellulose acetate, an extremely durable material for long lasting use. The 36″ beechwood shaft is seasoned with brown lacquer to enhance the wood grain of the beechwood. A brass ring sets off the handle of the finely detailed graceful animal we all love. I love my whippet so much that I named one of my companies after him, Greyson Place. It is an online website where you can find the awesome products shown above. Just click on the picture and it will take you to my site. I hope I have inspired you to find a love for this wonderful animal. Whether you are hugging one or just adoring one in decor in your home, I am sure it will bring a smile to your face.